100 b-w + 330 color illus. Universally recognised as a brilliant and gifted eighteenth-century artist, Zoffany was regarded by Horace Walpole as one of the three greatest painters in England, along with his friends Reynolds and Gainsborough. He has remained without a detailed study of his life and works owing to the fascinating and complex vicissitudes of his career, now established from widely scattered sources. Starting out as a late-baroque painter at a German princely court, he moved to London in 1760 and soon became a leading portraitist. A loyal patron was the great actor David Garrick through whom Zoffany became admired as the unrivalled interpreter of the Georgian stage. The delightful inventions of his conversation pieces proved, then as now, fashionably successful images of private lives and led to his swift rise into the royal patronage of George III and Queen Charlotte. Sent by the queen to paint the celebrated Tribuna of the Uffizi in Florence, Zoffany while there received commissions from the Empress Maria Theresa for family portraits which took him to the courts of Vienna and Parma. Back in London but out of favour with the fashionable world, he left for the Bengal of Warren Hastings. Portraying the Anglo-Indian society of Calcutta, and working up-country at the glittering court of the Nawab of Lucknow, he developed a serious interest in Indian life and landscape. His fortune made, he returned with impaired health, but continued painting pictures of India, theatrical scenes and portraits, turning in old age to attack the bloody progress of the French revolution. 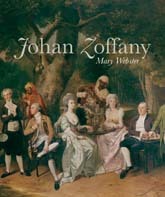 Zoffany set foot in so many worlds that their contrast alone gives a constantly changing interest to the history of his life and work: his pictures document with incomparable liveliness the worlds and people among whom he moved. Mary Webster was formerly at the Warburg Institute and was curator of the College Art Collections at University College London.